Yes. I’ve been on the road. Still am. For an account of part of my trip, check this link. But I couldn’t resist drawing this cartoon to your attention. This modern world has been a little disappointing in recent weeks, but Tom Tomorrow seems to be back in form. Here is an excerpt – click on it to go to the whole cartoon. “We always maintain the option of striking actionable targets, but we also realise that Pakistan is a sovereign government and a very important player in the war on terror,” he added. …any military action inside our borders under an excuse of hunt for Al Qaeda militants will not be acceptable…If any such attack is made, it will be a sheer breach of international laws. Her comments apparently irked American journalists. They pressed Mr Snow for a response at a regular White House briefing. And what self respecting American ‘journalist’ could fail to find such audacity irksome? Who does Ms Tasneem think she is to suggest that the US military should refrain from carrying out attacks within the borders of her country? The cheek! (b) The fact that a State has sovereignty is an argument against attacking it militarily. 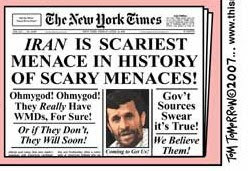 Dubya is probably hoping that the Iranian Government wasn't paying attention. Of course, Snow wasn't listing any other sovereign States, or saying that sovereignty was a sufficient legal protection against invasion, but then we can't have everything, can we? I assume you write tongue in cheek, ABIM. In any case, you know as well as I do that it's not important or necessarily desirable for propaganda to actually make sense, so what you may be able to read into a statement logically may not be something the person making the statement will admit to. I can't read the quoted passage as admitting sovereignty conveys immunity from attack. I think he meant sovereign in the more conventional sense of having the authority to make decisions without reference to others in the jurisdiction. In that sense, Pakistan is free to allow the enemies of freedom to organise from within the territory over which it exercises sovereignty. Since Pakistan is an important player in the war against terror, 'we' won't flatten Islamabad. But by the same token, if Pakistan will not exercise its sovereign duty to uproot the terrorist infrastructure, the US maintains the sovereign right to strike actionable targets. After all, they call for action. By definition. In answer to Gabriel, welcome. I left a comment over on your blog. If the US or Israel attack Iran, I am not anticipating a ground invasion. I think they will be inclined to rely more or less exclusively on air power. They may or may not realise by now that they can't 'win' a war by air power alone, but you can do a hell of a lot of damage. When they threaten to bomb you 'back to the stone age', it's not that much of an exaggeration. Missiles and high altitude bombing...lots and lots of collateral damage...that's what I would expect. On the other hand, these neocons don't ordinarily futz around so much and I kind of would have expected them to have struck by now if they were serious about it. If I understand Stratfor correctly, they have been arguing that Iran, the birthplace of chess, has manipulated the US into a situation where the US must rely on Iranian cooperation even to withdraw from Iraq without too much disgrace. It could be that the US understands that it needs Iran at this stage and won't rock the boat for the foreseeable future.